Most companies choose SAP SuccessFactors to improve the way they deliver their HR services. They are looking to implement this cloud-based software fast, with low effort and low risk, which means they are looking for best practices. Going through lengthy scoping workshops to implement existing processes cannot be considered an option. Instead they want us – SAP – to advise them on the best way to do it. They expect implementation projects to be a lot faster, cheaper, and easier – especially if they follow best practices. If these challenges sound familiar to you and you want to benefit from SAP SuccessFactors’ innovations and leading HR practices, you might want to learn more about the SAP SuccessFactors Process Library – a unique and specific body of knowledge, created and maintained by SAP. The SAP SuccessFactors Process Library supports companies’ transformation of HR based on the leading cloud solution for HR, as well as enabling them to drive standardization and fast adoption. Why should you need an SAP SuccessFactors Process Library? There are three parts: Leading practices, process summaries and process diagrams. 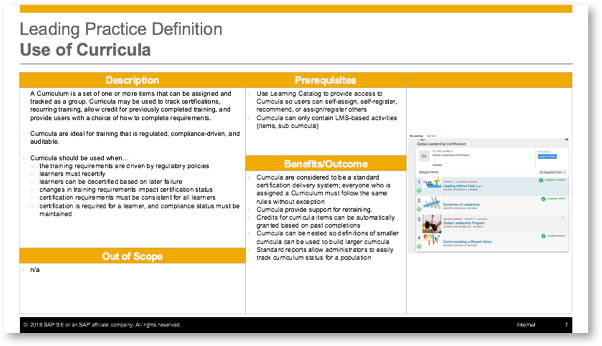 Which leading practices were used to model the processes for SAP SuccessFactors? The collection of leading practices describes SAP’s recommendations to HR to implement SAP SuccessFactors. The process summaries describe a ‘use case’, often a (sub) process. They also define when and how a process starts, ends, what dependencies exist to other processes, who the participants are and what the main purpose is. 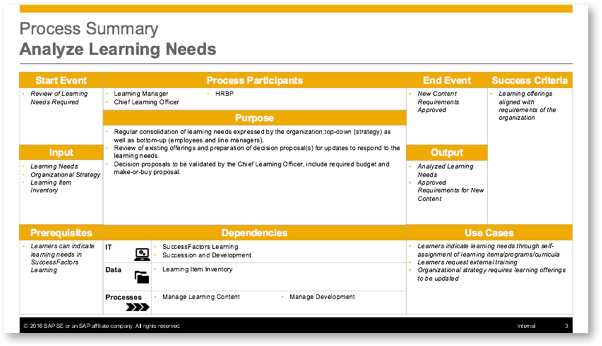 This asset helps you to define your HR goals for this process based on SAP SuccessFactors standards. The process diagrams for the SAP SuccessFactors Process Library are built to define HR processes end-to-end and specific for SAP SuccessFactors. They include all relevant activities in swim lanes, which represents the major user roles. User roles were defined based on the leading HR operating model: HR Business Partners, HR Center of Excellence (CoE) and Shared Services. 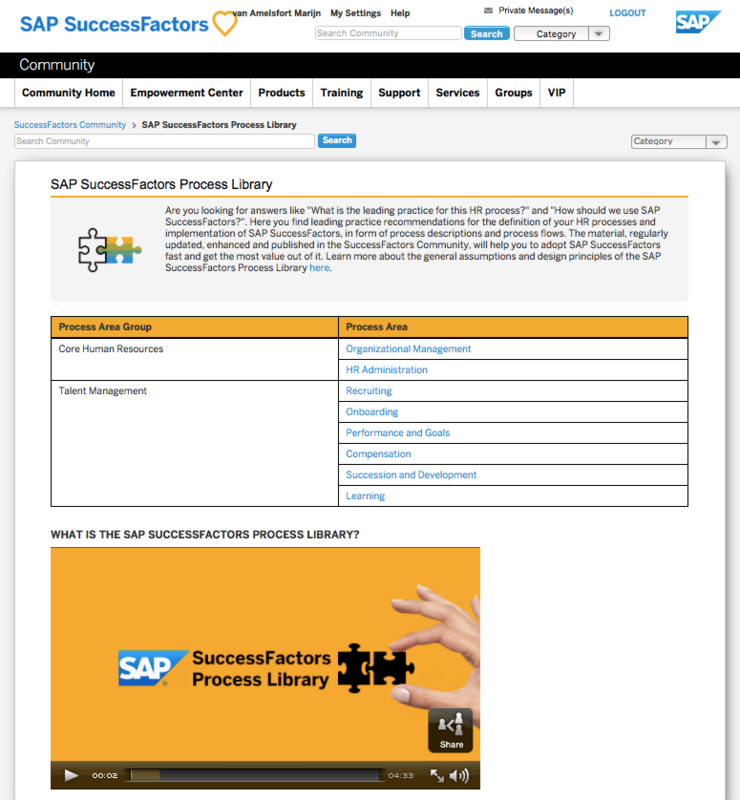 Where can I find the SAP SuccessFactors Process Library? You can download the assets free of charge from the SAP SuccessFactors Community under Empowerment Center > Implement > SAP SuccessFactors Process Library. Please provide your feedback and comments on the product resources blogs in the SuccessFactors Community. In case you need support in managing and facilitating the adoption of the leading practices in your company, please contact the HR Innovation and Transformation Services Team from SAP Digital Business Services at SAPHIT@sap.com. Please feel also free to contact me! Enjoy the SAP SuccessFactors Process Library! It doesn’t seem that there are any materials available under the SAP SuccessFactors Process Library currently? Shows 0% and clicking collapses and expands an empty results area. Apologies for the late reply! If you click on the link in the section “Where can I find the SAP SuccessFactors Process Library?” a page like shown in the picture below should open – from where you can access the content. If you still have trouble finding the content, please feel free to send me an e-mail with a screenshot from your device, so I can support you! The link you mentioned is not working. It is showing HTTP 500 internal server error. Could you please provide the correct link? I tested the link again and it is (still) correct. I don’t know why you receive an error, but please be aware that you need an SAP User Account to be able to accessÂ the content on the SAP SuccessFactors Community.